A haute Hamptons grill fit for Wall Street. 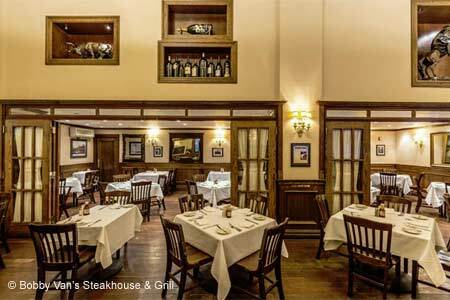 : Bobby Van's Steakhouse & Grill, first established in the genteel enclave of Bridgehampton in 1969, is serious about the real estate mantra location, location, location. Located diagonally across from that bastion of capitalism, the New York Stock Exchange, Bobby Van's boasts a spacious, high-ceilinged dining room, with Edwardian-style light fixtures and Remington-esque sculptures of eagles and buffalos. Solicitous waitstaff in long brown smocks are kept scurrying to deliver giant platters of huge shrimp, lobster tails and (of course) cuts of beef, dry-aged in-house for a minimum of 28 days. What's more, Bobby Van's meat is chosen by the great-nephew of Peter Luger, a name which translates to ultimate in the minds of discerning carnivores. 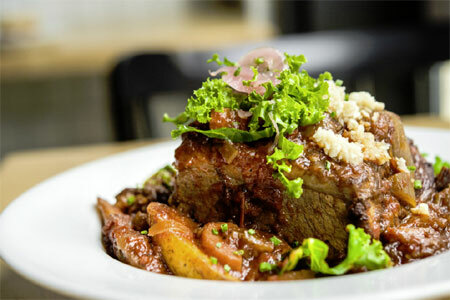 And this beef, with its buttery texture and rich salinity, is enough to make a vegetarian reconsider. Typical sides (creamed spinach, hash browns) are also handled with care. The more casual diner will head downstairs to the Grill, which offers more reasonably priced takes on the menu with offerings such as medallions of beef Bordelaise, sesame-crusted tuna, hefty burgers and lobster cocktail, all served in the unusual setting of a 1902 bank vault---complete with original safety-deposit boxes along the walls and paisley-patterned padded banquettes.